I fell in love with this phrase after reading Ellie Rennie’s post: The Amanda Palmer effect. The post is worth a read and the link to Amanda Palmer’s talk is worth (re)visiting. As I start a new school year, I’ve been reflecting on some ‘rules’ or ‘wishes’ I have for my classes. One of these was ‘choose to learn‘ – something I’ve been using for a few years now. It’s served me well, I must add. Yet Rennie’s post and the phrase itself – ‘Dare to be wise’ – have compelled me to re-think and quite likely re-phrase my rule. I find the phrase more exciting and engaging and I daresay, challenging.While choice can sometimes (often?) necessitate a sense of daring, I think the verb ‘dare’ is more direct and implies risks to be overcome to gain something worthwhile. Wisdom as the goal is also more specific and positive than ‘learn’ (aside: is all learning good? I’). Implicit in the phrase is the possibility of making mistakes which I struggle to communicate across. I find “It’s okay to make mistakes” a tad trite. Besides, it’s rare for people to set out to fail. Surely, those who expect failure persevere in the hope of eventual success. The act of dare-ing is rendered more significant! I also love that Rennie highlighted the power or social networking along with the daring of asking (the Amanda Palmer effect). Rennie did not go into vulnerability, what I think is the flipside of daring which, in my experience, opens up possibilities for learning and wisdom. Perhaps it’s ultimately mere semantics but I do marvel at the effect of words. I don’t know if the phrase will be more effective but I’ll give it a go this year. Marvel and then Dare to be wise. We write our own reports? Ever had an idea you just had to act on? So, I asked my students to spend the next 15 minutes drafting a 500-character report comment for IST. I mentioned that I have already drafted their reports – which was true – and that I wanted to make sure I did not miss anything – which was also true – and that I would use their input – which was more or less true. I replied yes, of course. I write the words but in fact, what they do (or not) throughout the year is what is written in the report comment. So technically, students do write their own reports. Right? Awesome as they are, they humoured me and actually did the activity. It was an authentic context to reflect on the year that was, how they were as learners in my classroom and even how they could improve. No scaffold. No prompts. No advice from me….just the time and space to do it…and a bit of ‘rah rah’. I was so pleased by their honesty and accuracy of self-assessment. I was also pleased that my report comments got validated by theirs which, for my part, means I do know my students and that my data collection (via formative and summative assessments) and feedback systems work. Writing reports can be onerous, often due to sheer volume and tight deadlines. This has been a ray of sunshine. I would do this again as a win-win activity. That is, students reflect meaningfully on their learning – content and process and I, their teacher, gets validation and more importantly, personalised insights about them. The idea of going to NCSS Summer School posed a mini-dilemma for lots of reasons but in the end, I decided to go and what a good move that turned out to be. The ‘intensive’ in their blurb is for real. It was intense. This year, there were over 100 participants including 15 teachers (like me) who were meant to be just like the students – relieved of ‘duties’, so-to-speak. That’s interesting, in and of itself. I pride myself of being a good learner but being a student is different. Being a student (learning the content) as a teacher (learning the process/meta stuff, e.g. can I use how they teach to teach my students?) was full-on. I struggle to articulate all that just now so I’ll focus on my main NCSS reflections as a teacher….and hopefully, this would encourage other teachers (my main blog viewers) to give the camp a go. PBL as a term was never mentioned but that’s what it was. 4 groups had to develop social networking web applications and 2 groups developed embedded systems. Lectures were streamed as per student ability, interest and/or systems. Throughout most of the 10 days, there were Lectures followed by lab so students had opportunities to apply what they’d learned with the help of amazing tutors (more on this later). Tutors also helped with task and time management throughout the project which started officially on day 6. Groups had to brainstorm and decide on what they wanted to develop. There was even an all-nighter as happens sometimes in the industry. The camp culminated with a ‘graduation’ and presentation of group videos. Except, I’m finding out now that the project has not really ended as students continue to work on the projects and are now available online – for an even wider audience. There were also plenty of fun activities with plenty of opportunities to develop collaborative skills and team-building: Newspaper tower challenge, Trivia Night + Chinese (Whispers) Charade, Scavenger hunt, cryptogram, simulation/theatre sport, programming challenge and excursions to some sponsors’ sites (WiseTech Global, Atlassian and Google). All these activities were cleverly designed and well-executed. We used the University of Sydney’s School of IT facilities. We were told not to bring computers because, indeed, there were enough. We also used GitHub for version control and Sqlite3 for the database. They’ve configured Tornado for ease of use supposedly but I honestly wouldn’t know the difference – it still looked complicated for me. Analog-wise, whiteboards were used for planning and tracking. Tools used are all ‘free’ so in theory, anyone can do this. Videos are yet to go up but there are links to the web apps. Our group developed Word by word (my only visible contribution there is the tagline: write a word. read a story.). Other groups developed Tableau and Pose challenge. Amazing stuff! I honestly cannot replicate these projects in my classroom. It was a fun, intense, immersive and challenging experience. I met some amazing people, young and not-so-young, and had many fascinating conversations – people are truly interesting! I learned more about computing technology and computational linguistics(just a teensy bit). I learned more about teaching technology. I learned more about kids and how stereotypes persist even amongst the like-minded (still wrestling with why it’s so hard to get girls into computing). I learned more about effective pedagogy including planning and delivery. Surprisingly, I learned more about me. 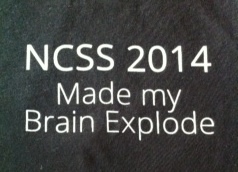 Not sure if I could make it to NCSS2015 or if I’ll ever get accepted again but I sure would like to go back. My next challenge is to incorporate some of what I’ve learned into what I teach.